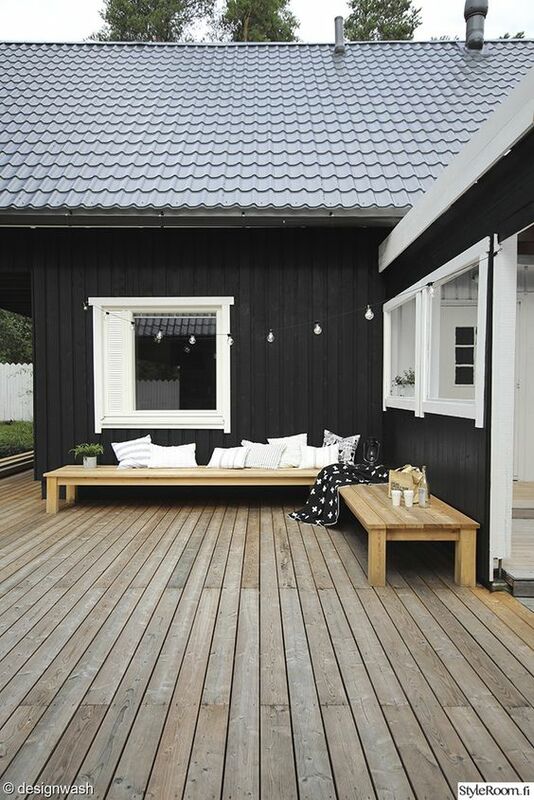 Have you noticed the trend for painting exteriors black? Would you consider painting your house black? It is certainly a very stylish look and one that is appealing because it makes a statement. In a world of greys and whites, it can be quite shocking to see a house which is black. Let me show you how you can make this more of a success. 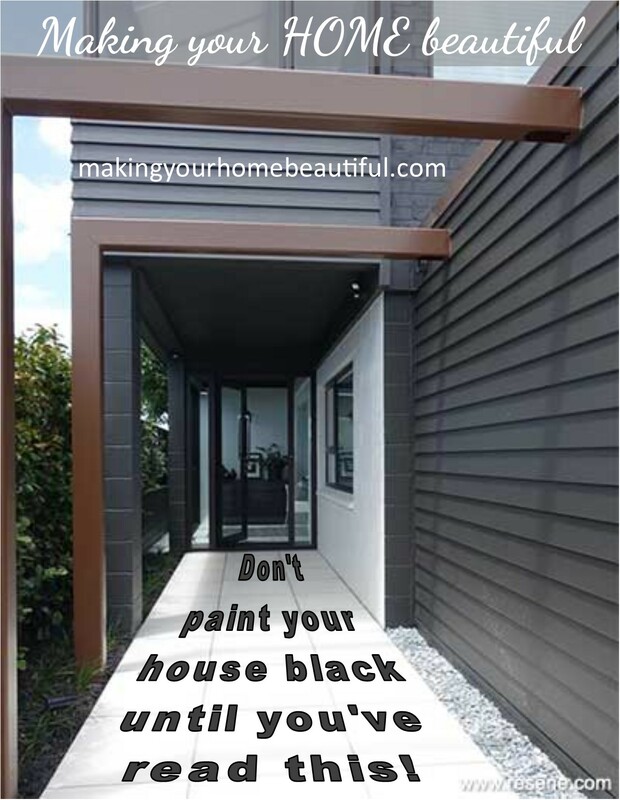 Planning to paint your house black? I absolutely love weatherboard houses. 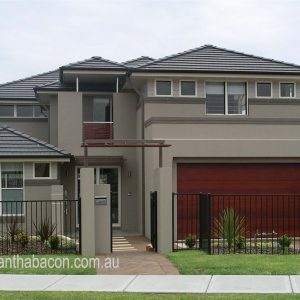 They lend themselves so well to the whole range of colours and tones for exteriors. 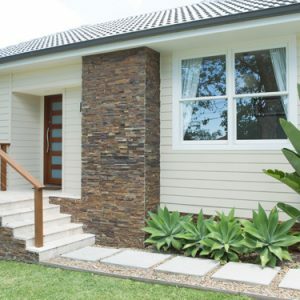 Colours that look great on weatherboards, often don’t work on flat rendered walls so if you have a weatherboard home, you have a lot more choice when it comes to choosing that exterior colour. 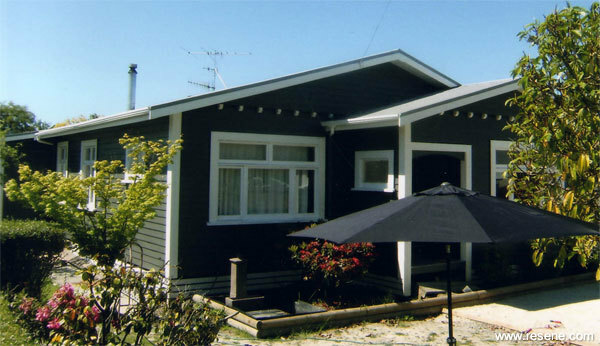 You can certainly be more confident with painting your house black if you have weatherboards. 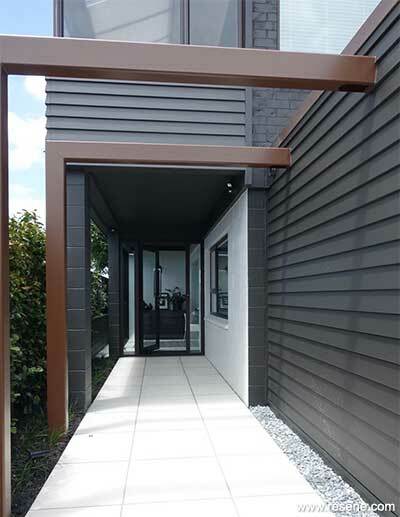 The reason that colour and really dark tones like black and dark grey work well on weatherboards is due to the natural shadow line created with the overlapping boards. A solid wall can be quite oppressive painted in black however the way that a lining board breaks up the surface of the house makes it more suitable for dark colours. Laid back and relaxed, weatherboard houses have a charm that is difficult to replicate with a brick or cement rendered house. 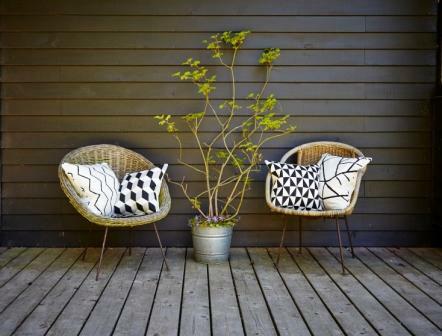 Popular at the moment is the use of black and white for both exteriors and interiors. 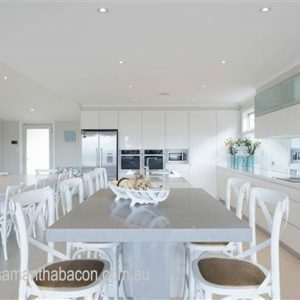 This bold tonal variation can create a very sleek and contemporary look, however when used on weatherboards with the edges softened, you can also create a fabulous country style relaxed scheme. Throw in a strong modern accent colour and you are back to contemporary again – the looks are endless. So don’t underestimate the impact of having an exterior black. An important point to remember however, is that an exterior black will absorb light and heat from the infra-red rays of the sun which will make your home uncomfortably hot during the summer. Historically, black has been used on barns in order to heat up the interior, for example in the tobacco growing areas of Kentucky, black barns are dotted all over the landscape. Black paint finishes are also popular for barn conversions in the UK where keeping the heat inside is usually a priority. So when you decide upon an exterior scheme for your house, particularly if you are in a very hot climate, this is certainly a consideration. Technology has come to the rescue however and there are dark paints available that actually reflect the heat. 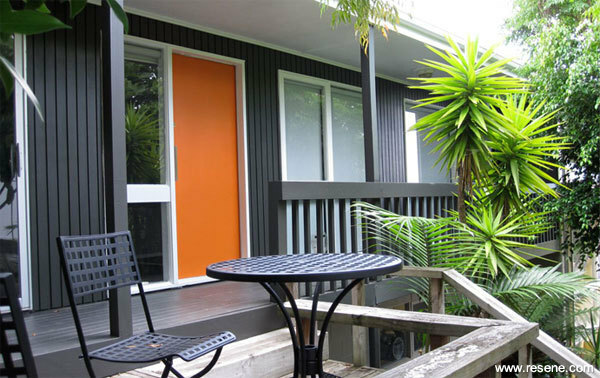 Resene’s CoolColour paint will perform in the same way as a lighter colour painted on the exterior of your home which means you can confidently use a dark black without ramping up the air conditioning throughout the summer months. Resene Bokara Grey, Double Cod Grey, Black and Double Gravel are all great dark colours to try. So, unless you want to fry in the summer, make sure you use a dark paint from a company that uses light and heat reflecting technology in their range. Readers in England – you may all want to rush out and paint your house black! If you are in a warm climate you may also need to reconsider selecting a dark roof as this will absorb the heat too and keep it in the house. A light coloured roof will reflect the heat so this could also be a consideration. It is of course the finishing touches that will really change the look and feel of the house. Opt for furnishings and accessories that are not too perfect, for example, hand painted antique furniture, original rattan pieces and weathered pots and containers are great if you would like a country style look. Soft furnishings really complete the picture and the Geometry collection by Pegasus at James Dunlop Textiles brings a striking touch to the scheme. If you are currently undertaking a renovation or building project or even just planning to re-paint your house then you should download my Free exterior checklist. 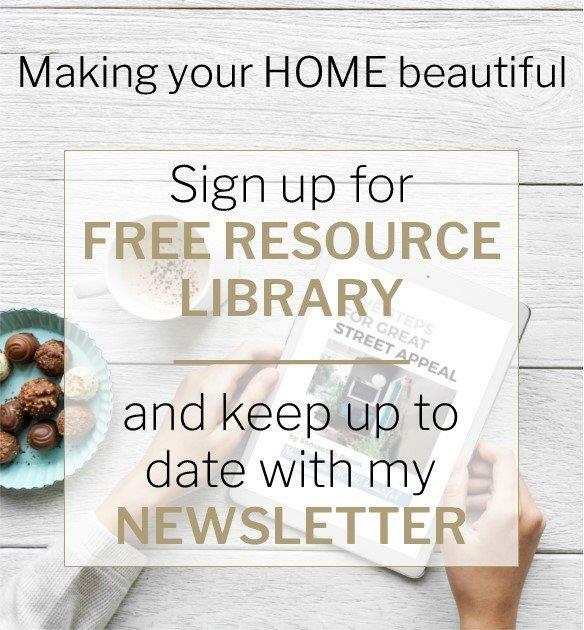 This can be found in my Free Resource Library which has other e-books and checklists and is updated with new free invaluable resources every month. Join up for free here. Loved this article! I really want to paint my barn and house black and am glad I read your article. Will be sure to get the paint you mentioned. Just wondering how long the black paint lasts until it has to be painted again. I would like to paint our new weatherboard home black but the painter refuses and the paint company he uses won’t guarantee the product. Because they are new weatherboards, is will cause more shrinkage and within 2 years we will have to repaint the whole house again which isn’t a option. Can you advise please? I have enjoyed your articles very much. I’d like to know your opinion on painting an unattractive green cement tiled roof. Don’t think I can afford to put on a new roof. What is the best paint/colour and how should it be done to make it last? I am so glad that I stumbled across your article as we are just about to paint our new home with Dulux Timeless Gray with Colourbond Surfmist window trims, black gutters and window frames and a white garage door. Our dilemma is that we have a big vertically cladded box section that is our garage and we don’t know what colour to paint it. We have been thinking that we would paint it navy blue, but I am a little concerned that the overall look may be too dark. I would really appreciate your ideas if you had any suggestions. Great article! We are building and doing a weatherboard home also. We’re doing an all white farmhouse style with black window frames, front door and garage door. Should we do the roof colorbond nightsky (black) to match the windows etc. or could we do monument Matt? So hard to decide. I’m building a new home with a cladded Hamptons front facade and Austral Chiffon bricks to majority of house. I had decided on colourbond “Wallaby” for the cladding as it was the closest match to the bricks (wanted a seamless look to sides of house where they will join). Wondering now whether Basalt (darker) would be better ? What do you think of Wallaby ? I have painted a sample board and outside it throws brown. I have shale grey roof and gutters (council won’t allow surfmist..) , surfmist fascia, garage door, windows and trim. We are building and have recycled red bricks. Black window frames and night sky fascia – shale grey roof. Some BareStone concrete cladding but also a fair bit of Weathertex cladding to be painted black. Question do we match in with window frames black or math the night sky black colour for the Weathertex. Are you familiar with these colours? With the roof extending down from the existing roof. The roof is terracotta tiles not new but old with a orange/brown colour. White or dark grey railings. Thank you Samantha, that really confirmed what I had in my mind. I find when it is your own house you are decorating it becomes more difficult as you tend to get too engrossed in the process. Interesting read, we have selected Monument for cladding and surf ist for render outside. We are using the Haymes range of paints for inside and want to paint media room wall as TV backdrop and the main bedroom was lol in a dark colour. The bedroom is mostly glass with extremely high ceilings, so it’s really just a small amount of surrounds around the sliding door to deck and upper feature windows. Windows and doors are in colourbond monument. What Haymes colour would work best in both these places, would like to keep consistent if possible. The main wall colour is Sift White from the Haymes range. 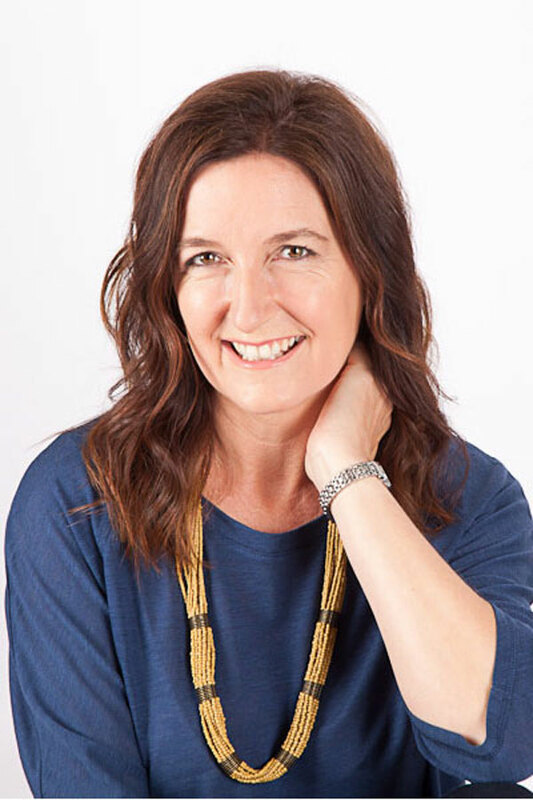 Hi Linda I can’t find Sift White in the Haymes range – is that the right name? 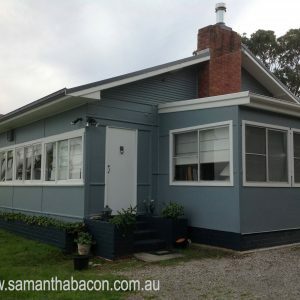 a couple of years ago I mixed my own colour for a federation country weatherboard home. Its similar to tranquil retreat. I recently tried to change the colour to Dulux terrace white as I love changing colours but my choice on this occasion hasnt worked and is too light and I have 25 Litres of it. I am wondering if you know if a colour already mixed (terrace white) can be changed to a different colour by a paint store.